Behind the dunes is the wonderful Alnmouth Village Golf Course, the oldest 9-hole course in England. On this day the fairways were brown and hard meaning the ball would run forever. By comparison, the greens were islands of lush green. I was frustrated not to be playing – in my head, sand sea and golf are inseparable. The roads are still salty, on most days they are uncomfortably wet and the air is still piercingly cold but, there is no resisting the call of the wild and the open road. Against better judgement I ventured out on two wheels on several occasions in March and was never disappointed. The still image is from a ride out to Carrshield and the video from a late afternoon ride to Allendale Golf Club – Home of Golf in the Wild. This is now accessible from the club’s website just in case visitors have difficulty finding the course – follow satnavs to NE47 9DH and you will be taken to High Studdon Farm. This will probably be my last post until after Christmas Day so a very Merry Christmas to all my followers, many thanks for taking the time to like and comment on my ever random thoughts throughout the year and all the best for 2016. This year’s Christmas card reflects my passion for hitting small balls with unsuitable sticks in wild places – hopefully the snow provides a sufficiently seasonal touch. This is the second at Allendale, a place you can now fly over at Aerial Golf Caddy. When you have a spare moment between the main course and the pudding, take a look; you may begin to understand my obsession with the place (two of the best ‘flights’ are at the 3rd and 12th, both par 3s). 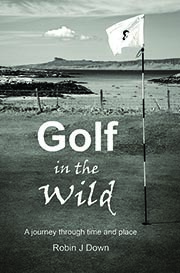 This week I am on a virtual golfing journey to Gairloch, dragging up notes, memories and stories about the village and its course from a trip in August this year and many others from years before. 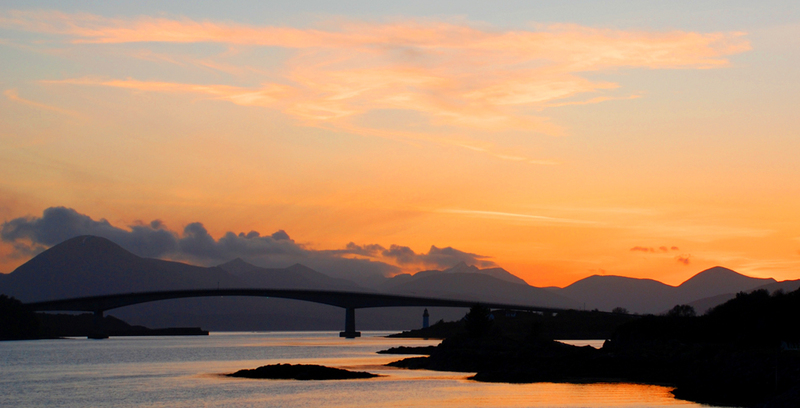 It occurs to me that many followers of this blog will have no idea where Gairloch is located. I recommend keying the postcode IV21 2BE into Google Earth, popping down into Street View and taking a look at ground level – this beautifully positioned course is clearly visible from the A832; the best view on Street View is from the church, opposite the club and beach car park. Gairloch is one of the few places I have stayed for any length of time in northwest Scotland, most times I have been on road trips, just passing through. Consequently I know the course and the surrounding area quite well and for once it is more about what to leave out of the book rather than what to include. During my research I have been assisted by photographs supplied by the Department of Special Collections at University of St Andrews Library who have provided copies of postcards from their James Valentine & Co archive. 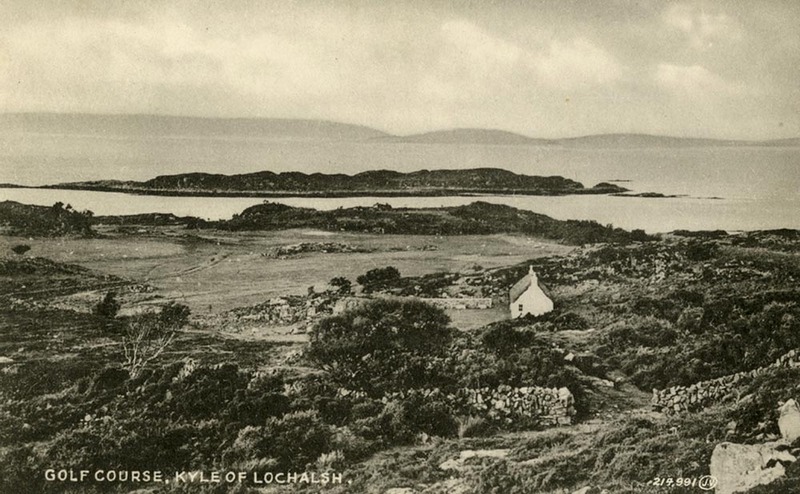 This view of the course taken in 1934 has not really changed that much in eighty years; the golfers are still overlooked by the distant church and the elevated tee appears to be following the same line as the current par five 526 yard eighth, Traigh Mor. This final picture is perhaps a better representation of the joys of playing golf at Gairloch. Taken above the sixth par 3 tee box, Westward Ho!, this is a tight tee shot with punishing rough to the left, trees to the right and a glorious distracting view towards the Isles on the horizon. It is an imaginative layout squeezed into a relatively small acreage. I must return. I don’t know when the course was abandoned but the evidence of former glories can still be found amongst the undergrowth and there was even a scruffy white flag attached to a bent stick planted on what was once a much tended green; not a flag of surrender but a symbol of sheer bloody-minded optimism, hopefully there is already a restoration committee making plans. Footnote: With reference to an earlier post, the 70 foot Eilean Bàn lighthouse is another Stevenson creation. 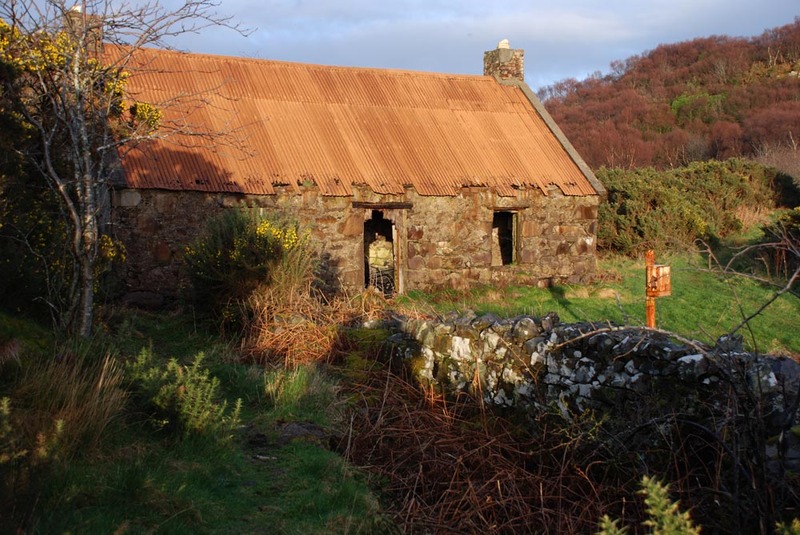 It was built in 1857 and designed by David (1815-81) and Thomas (1818-87) Stevenson, father of Robert Louis Stevenson. In the picture below the lighthouse is just visible beneath the right arch; elegant the bridge may be but I do wish it wasn’t there. I don’t suppose the islanders agree. 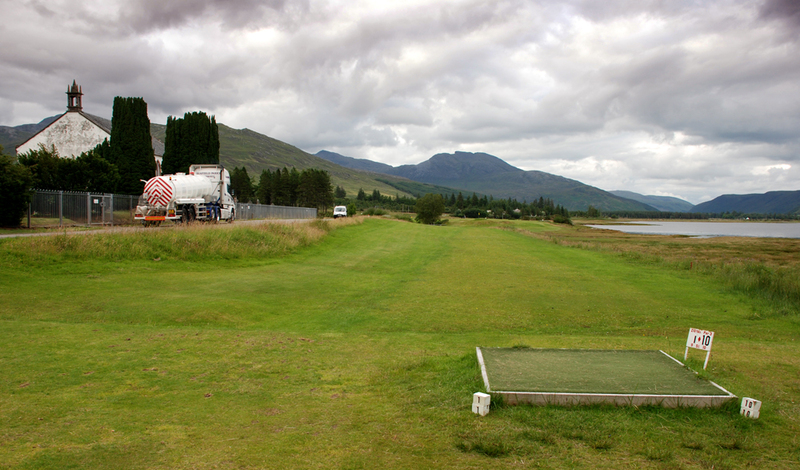 This is the gloriously unsettling view up the first at Lochcarron. Is there a more worrying opener anywhere in the land. How do the locals cope after too many whisky chasers the night before. 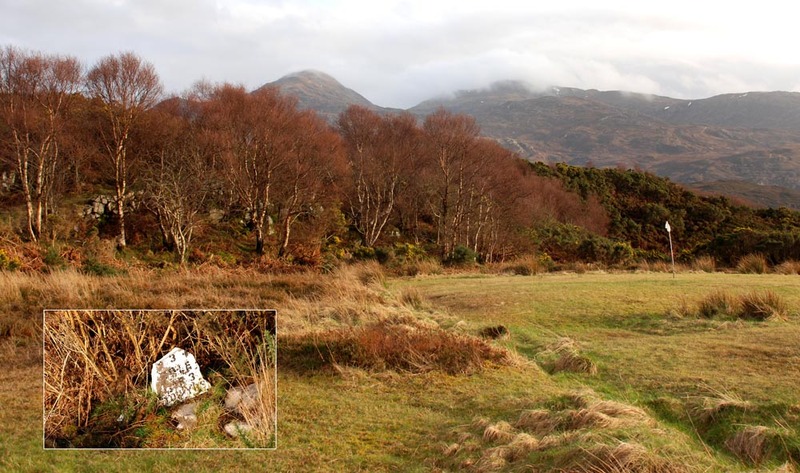 To the left is the unprotected A896 which heads north to Gairloch via Shieldaig, Torridon and Kinlochewe; admittedly single track for large sections and hardly the M6, it is nevertheless alarmingly close at approximately 18 yards to the left of the tee and a few feet from the edge of the fairway. A few paces to the right is the soft marshy edge of the loch. At its widest point beyond the church, the fairway is just 21.7 yards from out of bounds to water hazard (courtesy of Google Earth). The first par 3, Jimmy’s Seat, is 210 yards from tee to green but 126 yards out a burn cuts across the fairway so you need to drive a minimum of 150 straight yards just to be sure of clearing the water. And there is more; the burn arrives under the road parallel with the green and meanders along its bush lined left edge before looping round into the loch. Finally, the green is elevated so coming up short is not an option for a shot in regulation. Going for the green is out of the question, my limited armoury simply doesn’t include the required golf shot. I stood on the tee utterly perplexed. This felt more like target practice, archery at a distance far greater than the gents’ competition maximum of 90 metres. Short of the green, seemingly beyond the burn to the right, there is an inviting light patch of turf so I lined up in that direction, determined to play the ‘sensible’ shot. I came up too short on the edge of the pebbled burn, punched the ball onto dry land, chipped again to the green and two putted for five. A hacker’s double bogey, ending the hole with the same ball I had started with felt like a minor triumph. The thing that baffles me is that this is stroke index 9 whereas the par 3 stroke index 1 played across the road (beware high sided vehicles) seems child’s play by comparison. Don’t be put off by the description of the first, it is a wonderful setting for golf and on the July evening I played, completely bereft of the dreaded midge. The first three holes hug the shoreline, the fourth Stroke Index 1 plays across the A road whilst the rest circumnavigate the old church. This seems an odd setting for a course established in 1908 and even today it has its repercussions, the course closing when a funeral is being conducted in the graveyard, not the occasion for a wild slice into the head bent bible-black mourners. Similarly, competitions are played on Saturdays to avoid expletives echoing across green and shore to enhance the sermon; this may not be true. 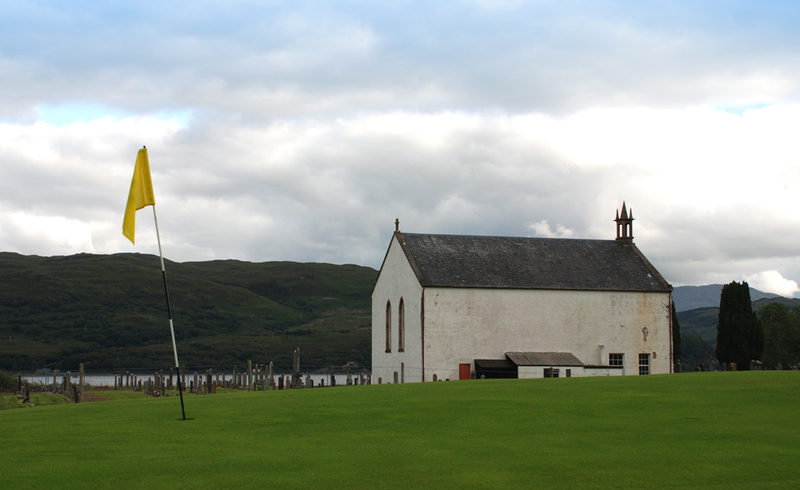 Playing golf on Sunday in parts of Scotland is still considered a sinful pastime but this doctrine is fundamentally flawed, assuming that golf is somehow a pleasurable activity rather than a parallel and complementary religion. We suffer for our sins at pulpit and pin. At just 1782 yards (nine holes) and only three par 4s it might not appeal to everyone but they would be missing something unusual and interesting; just keep an eye out for the traffic.